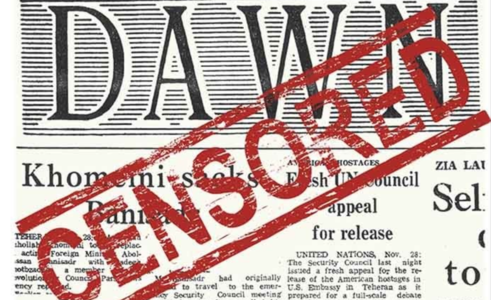 ISLAMABAD: In reaction to Dawn’s statement disclosing disruption in its distribution, journalists’ bodies, politicians and rights activists across the country have expressed concern over attempts to gag print and electronic media by way of physical intimidation, abduction and torture of dissenting journalists and blocking of news channels. The management requested caretaker Prime Minister retired Chief Justice Nasirul Mulk, Chief of the Army Staff General Qamar Bajwa and Chief Justice of Pakistan Mian Saqib Nisar to take notice of the hostile situation. Former Senate chairman Raza Rabbani was of the view that such actions went against Article 19 of the Constitution, which states “there shall be freedom of the press”. “Such actions are a denial of the fundamental right guaranteed under Article 19(A), the right of every citizen to have access to information in all matters of public interest,” he said on Wednesday. “If this campaign [of intimidation] continues, the holding of free, fair and just elections, as stipulated under the Constitution, will become next to impossible. Let such forces be warned that the social and political fibre of Pakistani society and the polarisation within the federation cannot withstand an engineered election,” he warned. The PPP stalwart said it appeared that a “hidden hand” was gradually “dismantling” the pillars of the federation in order to weaken it. 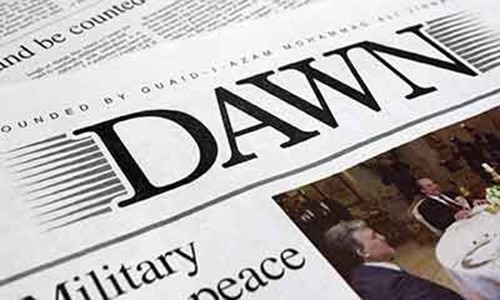 Javed Jabbar, who sits on a media commission appointed by the Supreme Court, also issued a statement in which he “strongly condemned” reported attempts to halt distribution of Dawn to its readers in various parts of the country. Mr Jabbar, who had previously served as minister for information, said there were reports from credible sources who stated that advertisers and ad agencies, which owed large sums to certain media firms, had been telephonically advised to withhold payments in order to create difficulties. Although, he said, he often “totally disagreed” with some of Dawn’s editorial and news policies, he stressed that the paper’s right to free and responsible expression deserved respect, not covert obstruction. “I endorse the urgent appeal made to the caretaker prime minister, the chief justice of Pakistan, and the army chief to give directions in their respective sectors to ensure immediate prevention of any coercive pressures against Dawn and other media,” Mr Jabbar said. Leader of the Opposition in the Senate Sherry Rehman called on the government to take action against reports of restrictions on media. “I firmly believe it is the right of every person to buy and read a newspaper of their choice, and any attempt to forcibly deny citizens’ access to it is a categorical violation of Article 19 of the Constitution,” she tweeted. The former minister stressed that impediments in the way of free journalism and acts of violence against journalists were unacceptable. We strongly support the "DAWN" statement. We will stand against these forces who abuses their limits and doesn't respect the freedom of press and rights of expression. These agencies should get ready for the consequences of their illegal actions soon. People can always read it online. We are with you DAWN! Hidden forces do not want Pakistan to progress and are trying to influence next elections. After doing engineering in Baluchistan and Senate elections the only hurdle against their aims is seems to be independent media! Very sad. If one is not free to say anything how can there be free fare election. Establishment should stop its policy of harassing anyone who opposes their view point. Dawn is doing splendid Job. Time is gone when hostile forces suppress media invisibly. Its electronic media no one can suppress Mouse Clicks and Keyboard Presses. 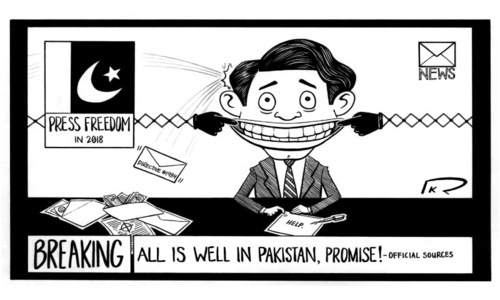 We Pakistani support independent media and DAWN right to express neutral point of view. Also media should not allow themselves to be used by foreign agencies to spread misinformation via Pakistani prestigious media outlets. Dawn provides high quality unbiased news and the people should have access to it. Do people not have individually or collectively, right of association expression and deciding what they like or not? It is too easy to cry foul only b/c one has media outlet and can do, say, let out whatever be in their business interest, right or wrong on any standards of responsible journalism or attempts opinion making. Public has to be always more important than any private, however powerful in anyway. IT is the doing of political parties. Readers support Dawn. That Dawn is under covert attack amounts to underhanded bullying & is clearly against Law & Constitution which guarantee freedom of Press to Pakistanis. We are being robbed of this freedom. Elections without a free media are vitiated of meaning. These truths are evident to all of us except to Denialistanis. The deep state should now recognize that such steps harm our people, our country and ultimately even itself, it should take a step backwards from self-harming policies.